US protests that Syria's retaking of Idlib from terrorists risks being the greatest humanitarian crisis of all time permeate the press. Cliched staged footage of 'White Helmets' rushing down dusty streets in Syria, purportedly to warn, direct and save civilians, insults the intellect. You wonder how the news announcers can bear to sit there pretending this is real news. Aren't they afraid of war-crimes prosecution when the dust settles? 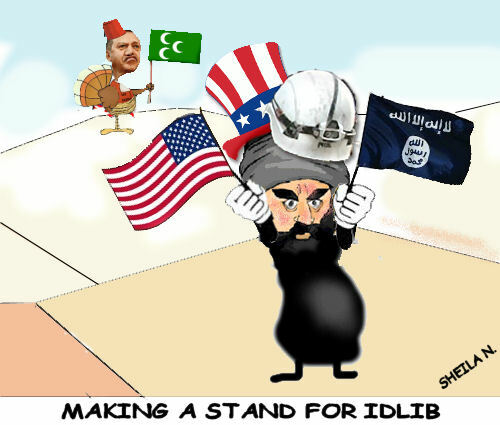 In fact, Idlib is the last province in Syria and in a region that remains occupied illegally by both the United States and other western forces  and terrorists, in a bizarre gothic partnership. The United States pretends that Idlib is the last province still in 'rebellion' against Syria's President Assad. This is false. Idlib is the last province occupied by US military. What the US calls 'rebels' are takfiri militants and mercenaries who have taken the local population hostage, apparently under US protection. Furthermore, Idlib has become the refuge of takfiri routed from other parts of Syria. 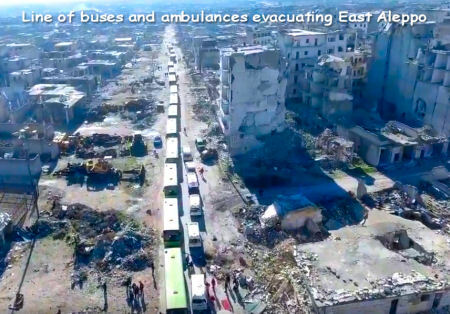 In the other terrorist occupied provinces where takfiri fighters had dug in and taken civilians hostage, like East Aleppo, Gouta and Daraa, the Syrian Government bused civilians to safety and allowed terrorists to leave in buses for Idlib if they chose, or be rehabilitated to serve in the Syrian Arab Army, before they bombed those who were trying to maintain a stronghold. See https://www.mintpressnews.com/the-last-bus-to-idlib-terrorist-safe-haven-in-syria-faces-a-cleaning-out/246956/. Many terrorists took the Idlib option and Idlib is now where the worst die-hard terrorists have gone to ground. The Idlib terrorists are relying on the protection of the United States, and the US is flooding the world with propaganda as though it might be prepared to fight Syria and Russia to save this hellish toehold they have illegally established in Syria's second most important province. Turkey's President Erdogan, despite his recent posturing against the United States over a failed coup in 2016, has taken a stance which comforts the interests of the US, claiming that Turkey cannot accommodate more refugees if Idlib is bombed. See https://www.smh.com.au/world/middle-east/after-rejecting-turkey-plea-russia-and-iran-back-offensive-in-idlib-20180908-p502l0.html. It is widely thought that Erdogan not only wants to prevent the formation of any Kurdish state, but hopes to establish this area as Turkish, which it was before the infamous Sykes-Picot Agreement of 1916, which carved up the Ottoman Empire and created the tensions in the area which have since been fanned by US-European interests, notably NATO. The Kurds have been used as pawns by US-NATO, which was considering using them as its toehold, however this caused conflict with its ally, Turkey, since the separatist Kurds want the same land that Erdogan wants for Turkey. "The Turkish position is not different from that of the US, apart from the change of language, interests and objectives. Instead of ensuring the security of Israel through the US in the Southwest region, there are Kurdish forces hostile to Turkey which has been striving for decades to curtail, dissolve and prevent Turkish Kurds from separating themselves and establishing their Kurdish state. Syria's strategy against the terrorists. Syria has crawled out alive from under a monster foreign-backed terrorist intervention, to everyone's amazement. And now she is trying to banish the monster. Not so long ago, people were shaking their heads and wondering how any country could survive the foreign-backed assault, how any government could survive the continuous psychopathic propaganda against it, but now they have hope. Meanwhile the United States can hardly believe that it is losing this war. It seemed like such a slam-dunk, another Iraq, another Libya - but not another Vietnam. How has Syria done it? They have used the same process for each enemy territory. To foil the insincere accusations that the government was persecuting civilians, Syria has sent buses to take civilian hostages out, and, at the same time, it has offered two solutions to the terrorists: either they can be rehabilitated in the Syrian Army and fight for Syria, or they could take buses to Idlib. So Syria has squeezed the terrorists towards its northern borders, city by city, whilst greatly limiting civilian casualties. The United States, which accuses the Syrian Government of purposely bombing civilians, has itself bombed civilians and terrorists alike in Raqqa, Iraq, along the north-east Syrian border. As Raqqa was reduced to ashes and stones, there were no buses to evacuate civilians or to allow press-ganged takfiri soldiers to escape. There never was a civil war in Syria and most of the remaining bad guys are now all holed up in Idlib, surrounded by human shields. And America says it's worried about civilians. But we all can see that America wants to keep its takfiri mercenaries in Idlib, like a mad sorcerer deploying his orcs from some terrible dark tower. Source: Their presence is unofficial. http://freenations.net/200-british-and-us-troops-trapped-in-idlib/ US troops are overtly present in a region touching Idlib. 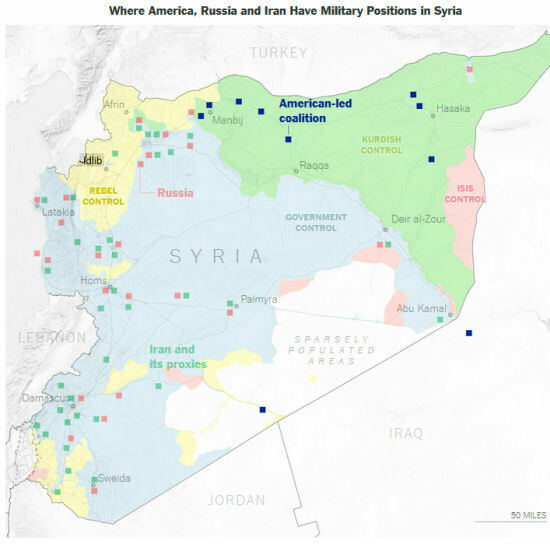 See the map below from the New York Times. Thanks Sheila - good analysis. I'd only add one thing, which is the covert role that Australia is playing in supporting the attack on Syria, and in putting out a stream of propaganda that suits the West's false narrative. You'd think they would outplay their hand, with yet more shots of WH running, child in arms to the ambulance, and in streets apparently devoid of all living things, even other White Helmets. It's hard to know exactly how you would use chem weapons on this lot and actually achieve anything, though given the sort of murderous barbarians they are, one could hardly blame the SAA for trying anything that would kill them without hurting too many civilians, or risking too many Syrian soldiers' lives. We just wait now for the proverbial s**t to hit the fan, while noting the presence of CW coordinator for the Syrian resistance in Melbourne today - Hamish de Bretton Gordon. Hi David. I meant to mention Australia's shameful role in this terrible saga, but ran out of time before I could get it in. So thank you for adding this. We have of course published your complaints about this, and mine. Reported on RT News on 11 September 2018. A reason given was that the channels were earning money and that this was illegal according to US sanctions. The removal of these channels means that the world has very little chance of hearing the other side in the Syria-NATO wars. As a result of this ban, all the videos we have of speeches by President Bashar al Assad have suddenly disappeared. This is utterly tragic; an erasing of hugely important historical documents. A crime against us all. Perhaps this will send people back to blogs and news sites like https://candobetter.net, in search of different points of view and complex information. In the meantime, there is danger that regime changes could again take place with no news reporting, as they did before the non-western world had access to electronic media in many languages.